Dentures are just like your natural teeth in that they get dirty with food particles and plaque, and can even become discolored from certain drinks and smoking. There is a variety of store-bought denture soaks on the shelves, but these products are pricey and sometimes ineffective. Try using a home recipe to make a product to clean and soak your dentures. Chances are, you probably have some of the needed ingredients already inside your home. Vodka is good for mixing up a Bloody Mary, and it's even used as a mold inhibitor around the house -- but vodka can also be used to soak your dentures. Not only will it disinfect the dentures, it can also help to brighten your faux smile. Using a wide-mouth jar that has a lid will save you money, because you can reuse the vodka several times to soak your dentures. Place your dentures into the jar, then pour enough vodka in so they’re completely covered. Let them soak overnight, and rinse them well the next day before putting them in your mouth. Baking soda and peroxide have been used for centuries in not only oral health, but health in general. When combined, baking soda and peroxide make the perfect soak for cleaning your dentures. Put 2 teaspoons of baking soda into a glass, and stir in a few drops of water -- just enough to dissolve the baking soda. Place your dentures into the glass, then add enough hydrogen peroxide to cover them completely. 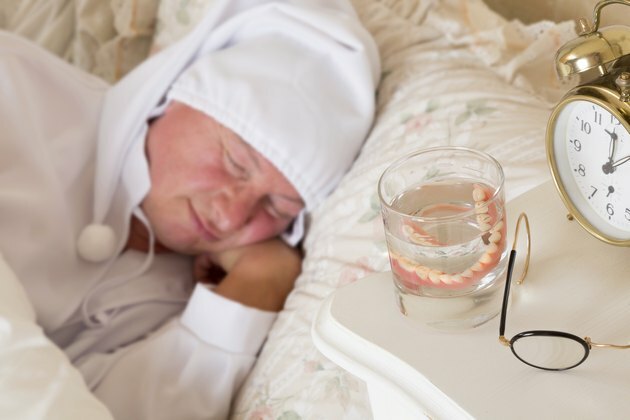 Let the dentures soak overnight, then rinse them well the next day. If you don’t have peroxide, you can use plain baking soda. Mix 2 teaspoons of baking soda with enough warm water to cover the dentures. Soak overnight, and rinse them off the next day. Chlorine bleach is used to whiten your clothes and disinfect household surfaces, and it works the same way on your dentures. It’s important to properly dilute the bleach so it doesn’t damage the dentures in any way. Mix 1 cup water, 1 teaspoon bleach, and 1 teaspoon water softener in a glass. You can buy water softener in the laundry section at most retail stores. Put the dentures into the solution and let them soak for 10 to 15 minutes. Brush and rinse the dentures well before putting them into your mouth. Do not use a bleach solution if your dentures have any metal parts or a soft lining, as the bleach will destroy these parts. White vinegar is an all-natural disinfectant, and using it to soak your dentures will get them clean and inhibit the growth of fungus. Mix equal parts white vinegar and water in a glass. Place the dentures into the liquid and let them soak overnight. Brush and rinse the dentures well the next day. Healing Teeth Naturally: Dr. Hulda Regehr Clark's Instructions for Brusing Teeth, Mouthwashes, Cleaning Dentures, Etc. What Cleaners are Safe for Babies?